Oliver Twist is on permanent display at Miller Outdoor Theatre. 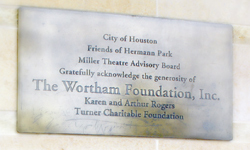 It was presented to the City of Houston in 1976 by Theatre Under the Stars, which presents a free Broadway Musical every year at the theatre. 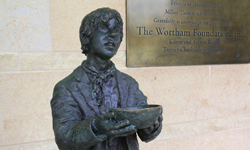 The sculpture portrays a young boy holding out a bowl, an artistic reference to the moment in the Charles Dickens novel Oliver Twist and the Lionel Bart musical Oliver!, in which the title character requests more gruel. It is made of cast bronze and stands on a concrete base. It is the work of Trace Guthrie, and was cast at the Al Shakis Foundry. Oliver Twist was the first public commission for native Houstonian Trace Guthrie. He completed it when he was 23 years old. It is one of several Guthrie sculptures on permanent display in his hometown. He studied art at the University of Houston, and has had a long career as an artist and instructor.